Popular East Village brunch spot Yuca Bar remains closed today after a fire ripped through the upper stories of its building on the corner of East 7th Street and Avenue A last night. Dozens of fundraising campaigns have netted well over $600,000 for victims of the March 26 gas explosion in the East Village. In addition to the online fundraisers we told you about previously, including one for a Jim Henson puppeteer that has brought in almost $40,000, yet another one — for Jimmy’s No. 43 — launched over the weekend. Last time we saw Patti Smith do “People Have the Power,” she was on stage with Miley Cyrus, Laurie Anderson, Debbie Harry and pretty much every other New York City music legend — and before that she was belting it out with Michael Stipe and James Franco. But she and Lenny Kaye kept it lean and mean at last night’s benefit at Theatre 80 for the victims of the East Village explosion. Check out the above footage posted to YouTube by Sandy Bachon. Today it was announced that Smith will release a sequel to her memoir, Just Kids, on October 6. Here’s the publisher Knopf’s description, via the Amazon page. The corner of St. Marks and Second Avenue was once again abuzz this afternoon, as a Small Biz Crawl brought much needed cash and customers to businesses adjacent the March 26 gas explosion. Business owners affected by the Second Avenue gas explosion met Thursday morning, some of them for the first time, at Cafe Mocha, across the street from where three buildings collapsed two weeks ago today. There was talk of struggles with insurance companies, frustration over not being able to reopen, and despair over lost businesses, but many said they feel lucky things didn’t turn out worse. The medical examiner has identified the second body pulled from the rubble of three collapsed buildings as that of Moises Locon, CBS News and other sites report. The 26-year-old busboy had been working 12 hours a day, six days a week at Sushi Park in order to save up money for a return to Guatemala, according to the Wall Street Journal. He planned to return to a girlfriend there, family members told the Times. A coworker told NY1 about his final moments with Locon. Neighbors, including the owners of Otto’s and Beauty Bar, help with Enz’s cleanup effort. (Photo: Mariann Marlowe). Businesses on the east side of Second Avenue have been allowed to reopen in the wake of the apparent gas explosion that brought down three buildings near East 7th Street, but their neighbors on the other side of the block are still reeling from the disaster. The Jim Henson puppeteer and his wife who lost their East Village apartment in Thursday’s blaze have raked in over $31,000 in online donations, but they’re still a long way from returning to normalcy. It’s been just over 48 hours since an apparent gas explosion rocked 121 Second Avenue, triggering a blaze that brought down three buildings on the corner of Seventh Street. As you can see above, damaged cars have been removed from the scene and search units are currently attempting to find two men who remain unaccounted for. (Here’s a view of that car from the front.) Read on for all the latest. In the wake of yesterday’s building explosion, “people stepped up and helped their fellow New Yorkers and it made a world of difference,” Mayor De Blasio noted in a press conference today. And it’s true: even apartment brokers are being decent and offering their services for free. For those of you looking to help, but without a hotel, car, or dry cleaning business to leverage, here are some options. 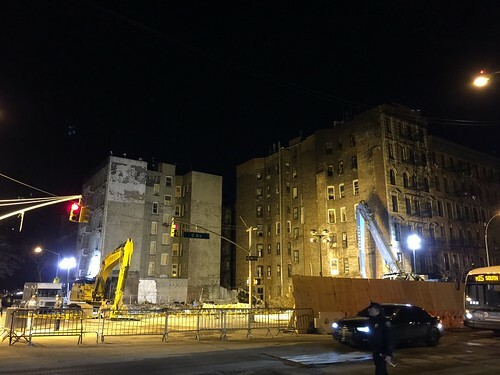 Officials are investigating the possibility that a gas line was accessed without authorization before the blast that leveled three East Village buildings yesterday.